With both hands raised and signalling “V” for victory, Canada’s Valerie Grand’Maison celebrates her win in the women’s 100-metre freestyle at the Beijing Paralympics on Wednesday Sept 10, 2008. It was her third gold medal of the Games. 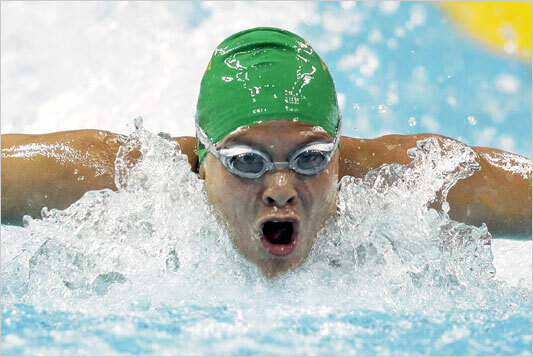 BEIJING–Swimmer Valerie Grand’Maison picked up her third gold medal of the Paralympic Games yesterday by breaking her world record in the women’s 100-metre freestyle for the visually impaired. Lauren Barwick added gold in equestrian and wheelchair athletes Chantal Petitclerc and Dean Bergeron raced to victories on the track as Canada picked up four gold medals on the day. Feeling good never felt more infuriating. Marlon Shirley, the world’s premier amputee sprinter, woke up July 3 with no pain in his knee — not from the half-dozen recent operations, not from the staph infections, not from other problems still lurking in there — for the first time in months. Yet all he could think of was: It’s too late now. I can’t be ready in time. 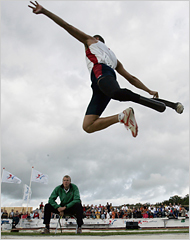 Marlon Shirley, above in the Netherlands in 2006, has two Paralympic golds in the 100 meters. Ready or not, Monday morning at the Bird’s Nest in Beijing, Shirley will blast from the blocks and run what he calls the race of his life — the 100-meter sprint in the Paralympics, the Olympics for disabled athletes, which opened Saturday. It might become the last race of his life, because for all he knows, his knee will explode somewhere around the 70-meter mark. But two months after assuming he would never race in Beijing, at least he would fail trying.